My husband and I celebrated our eighth wedding anniversary a couple of weeks ago with our first-ever night away alone together since our second son was born. We were married on the Central Coast of California and spent many a wine-soaked day during our month-long honeymoon at some of the world’s best vineyards. A trip to California wasn’t in the cards this year but we decided we’d drive an hour south to the beautiful region of Niagara Falls and Niagara-on-the-Lake (NOTL). And wow, what a gorgeous weekend it was. The leaves had recently started turning their autumn oranges and reds, the weather was absolutely perfect – and we were more than ready to have a grown-up couple of days to celebrate. 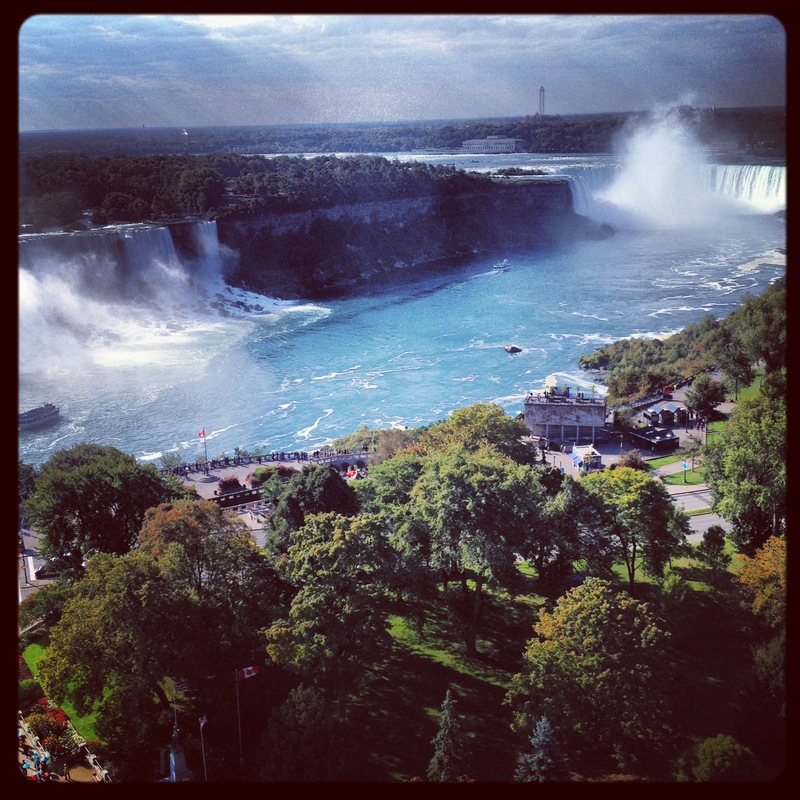 View of the Falls from our Fallsview room, Sheraton on the Falls. Autumn shows its mighty colours. 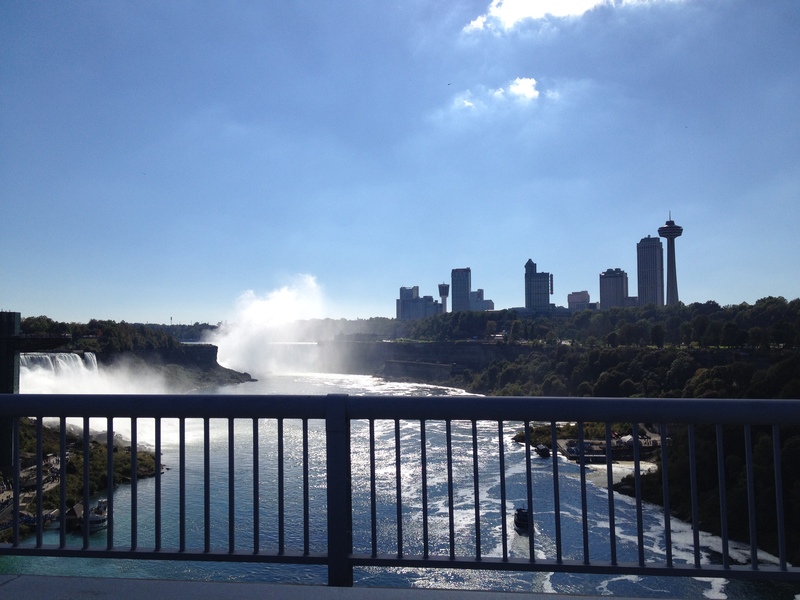 We arrived to Niagara Falls earlier than our check-in time so we decided to make a quick jaunt over the Rainbow Bridge to Lewiston, NY to stock up on some of our favourite American goodies. The wait time was decent – about 15-20 mins – and we were treated to a view of the mighty Falls the whole time. The view from the Rainbow Bridge while waiting to cross to the U.S.
We left U.S. Target with a couple of bags that included Cocoa Pebbles, Chocolate Chex and Honey Nut cream cheese, cruised around some insanely posh lakeside neighbourhoods, and retreated back to the customs line where we waited… and waited … and waited. We had yet to check in to our hotel and we had dinner reservations for 7 at Ruth’s Chris Steakhouse, its newest (and largest) location. I called the restaurant, switched our reservation for 8, and 1.5 hours later we were through after a couple eyebrow raises from our border guard regarding our cereal obsession. 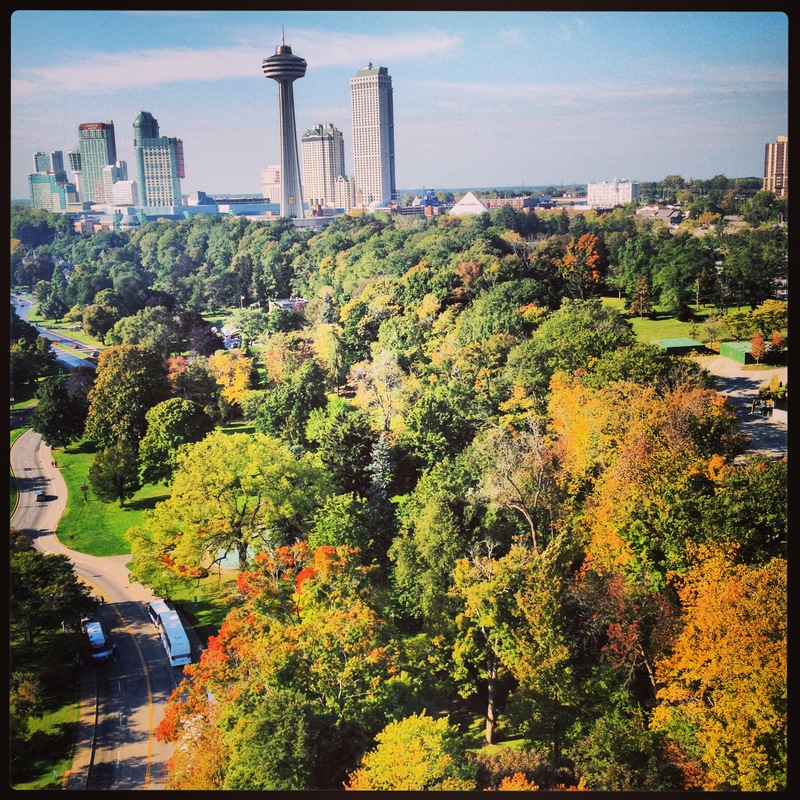 We drove straight to the Sheraton on the Falls (I’d purchased a Travelzoo voucher which I was able to upgrade to a Falls-view room on one of its highest floors). It was worth every penny. 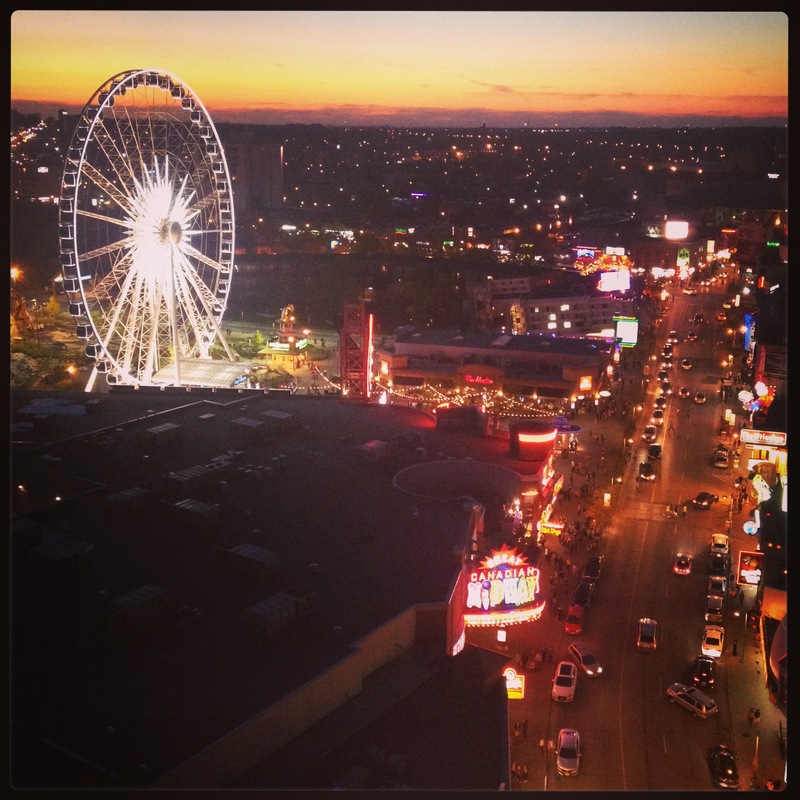 We watched the sun set from our juliet balcony and enjoyed breathtaking views of the Falls, the parks (the leaves looked like they were on fire), the famous Clifton Hill strip, and hundreds of miniaturized people and cars out for the night. I’d been to Niagara Falls dozens of times but I’d never seen it from up high. It was a totally amazing experience. After a good 35 minute walk, we finally arrived to Ruth’s Chris – a steakhouse that’s been on my list of places to try for at least 10 years. We were in the mood for a damn good steak and some red wine. The prices are definitely higher than your typical steak restaurant – side dishes are extra – but man, is it worth it. I ordered the rib-eye, medium, and hubs ordered the filet, medium, and we split a side of the most flavourful mushrooms and mashed potatoes. We ordered a bottle of Hahn Pinot Noir (Monterey, because we had, after all, gotten married there) – just totally amazing. Obligatory food shot. This is my rib-eye, cooked to absolute perfection. Sure, it could have been my lovely date and the fact that we were just happy to be together, alone, and in the mood for celebrating but the meal, friendliest staff, and fabulous atmosphere (all tables are in their own separated banquette rooms) made this one of the best dining experiences of my life. 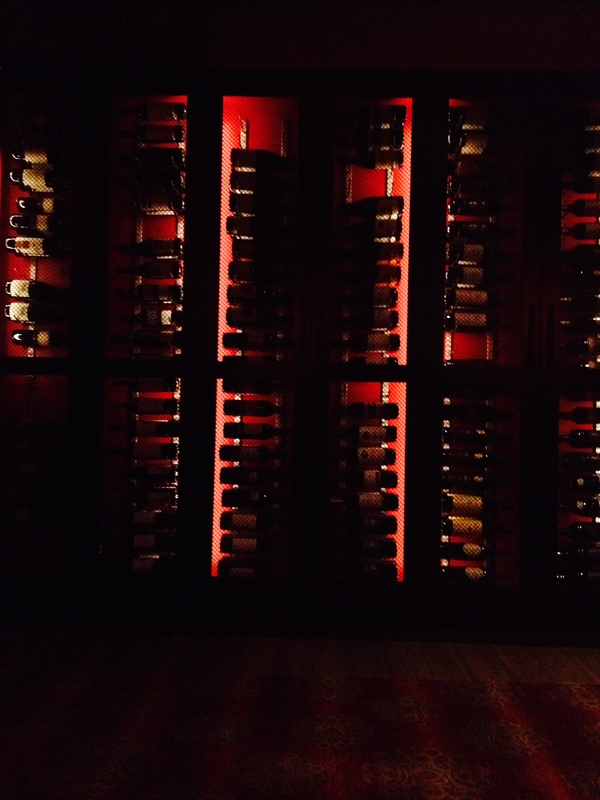 Wall of wine, Ruth’s Chris Steakhouse. The selection is reasonably priced and hard to choose from. Afterwards we decided to walk off our steak and wine-induced clouds to – where else! – the casino across the street. We’re not much for gambling but we had $25 in credits that was included in our hotel package and the hubs was itching to use it. 25 minutes later (and an additional $20 of our own), we were out of there. We decided to walk back to Clifton Hill by way of the Falls, always particularly lovely when illuminated at night. Our next stop was the Skyview Ferris Wheel ($12/person), a new addition since I’d last visited the Falls (has it been that many years??) and mostly filled with tipsy couples at that hour. This is by far the best view in the city – mandatory for anyone who hasn’t seen the Falls up high – and the erupting volcano and dinosaurs from the mini golf course were entertaining as well. 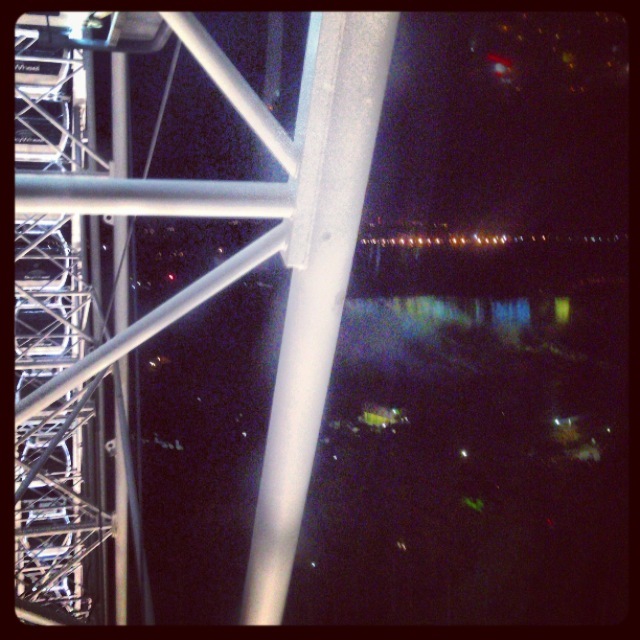 Best view in all the city: Up high above the Falls on the Skywheel. We headed back to our hotel room, intending to take a wee rest before heading out for a nightcap, but the wine, the insanely comfortable king-size bed, and the last half of SNL, did us in for the night. We awoke, unusually refreshed, after a full night’s sleep, with no toddler crammed between us, at our own leisure. Check-out wasn’t till 12 so we decided to take advantage and lounge around as long as we could. We still had some shopping to do so we walked down Falls Ave, checked out the Hershey store, and walked back up to Clifton Hill to grab a bite and some souvenirs for the kids. 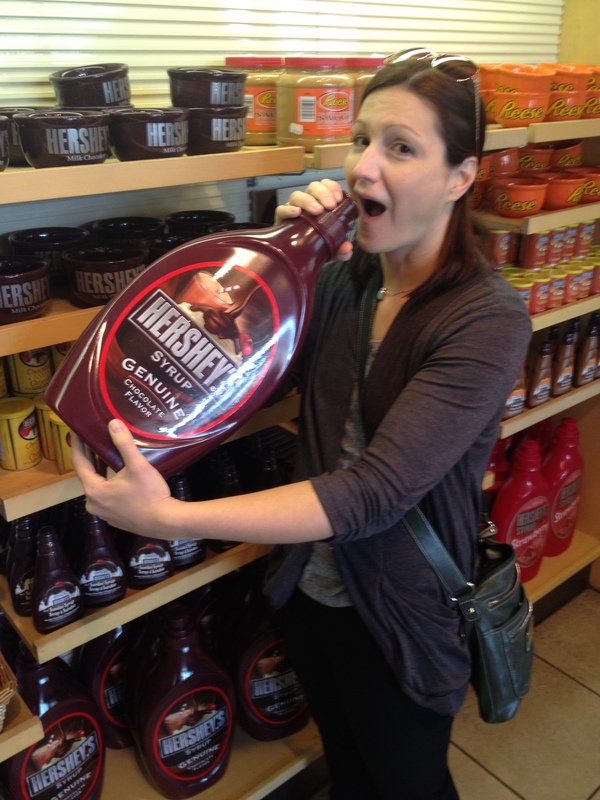 No, this is not one of the souvenirs we bought! We decided we’d better head over to Niagara-on-the-Lake as we had reservations for a bicycle tour through vineyards. I hadn’t been on a bike for at least a dozen years so I was a bit apprehensive. When we arrived in NOTL, we were wowed. We’d gone through some of the vineyards before but had never actually been to the village. 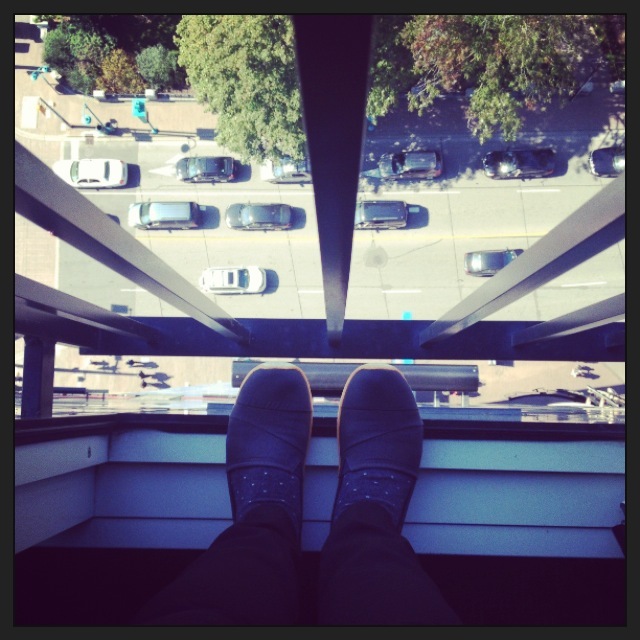 It was a gorgeous early-fall day – sunny, temps in the low 20s – and it was packed! We parked a couple blocks away from Queen Street and made our way to Niagara Tours to pick up our bikes. The lovely lady first chided us for coming so late as the free tours included in the deal had already ended – but honestly, we just wanted to ride some bikes and drink some wine, then gave us tons of tips on the best wines and a shortcut back. We were off! Our bikes, rented via Niagara Tours. The bike route takes you past some absolutely stunning views – we rode a part of the Niagara River for a while, overlooking the homes across the water, each dock dotted with their own sailboats. We travelled through parks and woods and farmland and fields and when we finally reached our first one, we were ready for our samples! Reiff, Frog Pond Organic, Peller, and two others I’m sort of over were included in this tour: the most generous pours came from Reiff – and we ended up buying a couple bottles , which would be waiting for us back at the bike rental shop upon our return. The Niagara River, as admired from the bike trail. The Frog Pond Organic grounds definitely had the most ambience – chickens and sheep and massive gardens and picnic spots surrounding an old farmhouse – it was an old favourite of ours. 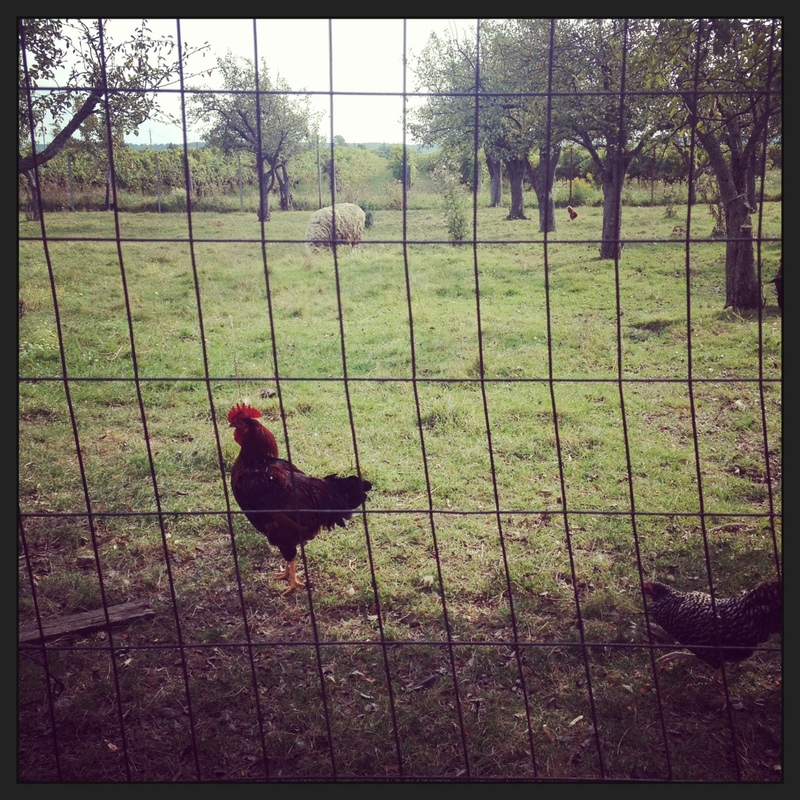 The rustic farm at Frog Pond Organic: Just the way a small farm should look! 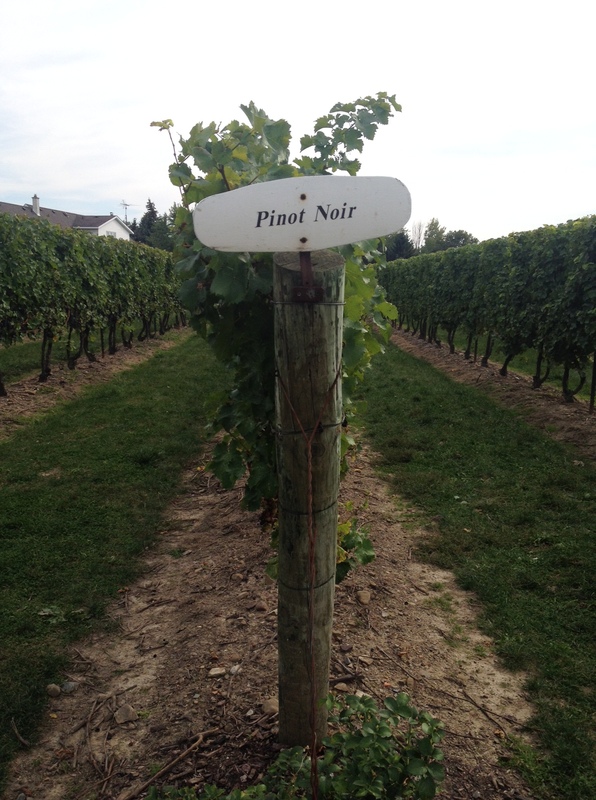 We made it through through wineries – the last at Peller was kind of a speedy tasting as we needed to be back at the shop by 5 to return our bikes and pick up our wine – but we’d been there on a previous trip and I’ve never been overly impressed with their wine. The shortcut sure came in handy here – we cruised back, somewhat tipsy and energized from the wind and wine, huge smiles upon our faces. It was an absolutely surreal, amazing experience – one we will remember forever. 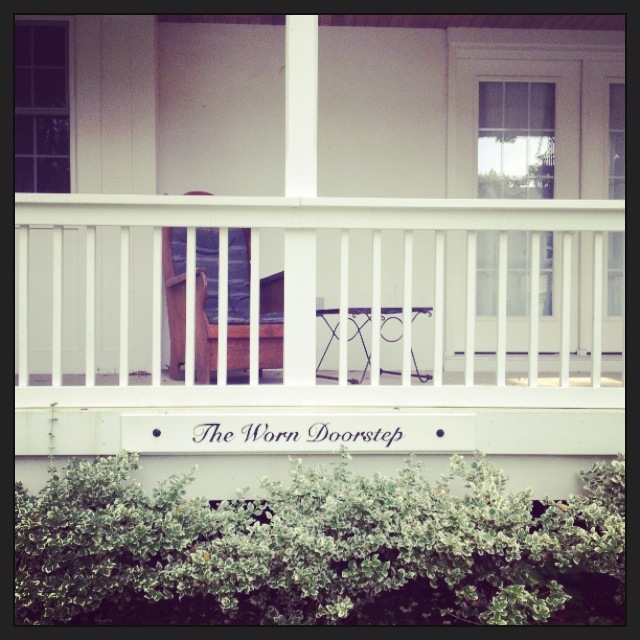 I’ll definitely be back – perhaps next time with some girlfriends! We returned the bikes, retrieved our wine, then decided to grab a bite at one of the many restaurants along Queen Street. At this point evening was setting in and we were beat – we grabbed a coffee and decided it was time to head home and gather the munchkins up and take them home. All in all, it was a short trip but one that re-connected us in the best way possible. And every mom and dad needs some of that to make things right. One of NOTL’s many, many B+Bs. Loved the name of this one. Love how pretty that place looks!